Ross McElwee's genial humor has guided him through some of the more thoughtful feature documentaries of the last 25 years: his pioneering Sherman's March (1986), Time Indefinite (1993), 6 O'Clock News (1997) and this year's release, his sixth feature, Bright Leaves. In each of his decidedly personal films, McElwee journeys from his base in Cambridge, Massachusetts, to his home state of North Carolina, visiting with old friends and family and using the past as a jumping-off point for his cinematic ruminations. He's inspired by these "periodic transfusions of Southern-ness." Although McElwee intends for each of his films to stand alone, the viewing experience is made richer by watching his preceding work. Characters and family return in his longitudinal study of life. "One of the things I am interested in as a filmmaker is how much we change and how little we change over time," says the filmmaker. Though not strictly a continuous series, each of his films can be viewed as a chapter documenting a phase in his life and its inherent emotional, political and psychological concerns. In Bright Leaves, McElwee's central question is legacy: his legacy as a filmmaker, a father and a son as well as his own family's history. McElwee's great-grandfather, John Harvey McElwee, was the originator of Bull Durham tobacco and was a rival to the Duke family, progenitors of Phillip Morris. Bright Leaves begins with a provocative image of prehistoric-looking, luminously green tobacco leaves. "The leaves are luxuriant," McElwee agrees. "Implied in it is an opiate quality, which has a way of seducing us into submission. It's a theme that runs throughout film—the seductive presence of tobacco in our culture, our lives and especially in our country down south. The flip side of the leaf is the problems the leaf brings to so much of the world." 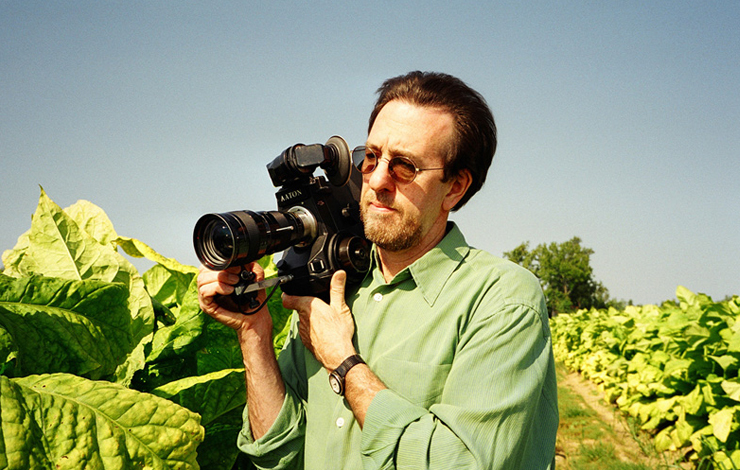 Nevertheless, McElwee chose not to make an anti-tobacco film. "The film is about movie making and legacy and what we pass down from one generation to the next," he contends. In McElwee's case, it's an agricultural, pathological trust fund. What's preserved, passed down and cured (in the context of tobacco) as family history is what McElwee explores, using the apocryphal story of his great-grandfather. Once a prosperous tobacco baron, John Harvey McElwee eventually went bankrupt after a decades-long dispute with the wealthier Dukes. Where the McElwee mansion once stood is now a parking lot, while the Dukes are practically canonized in North Carolina, America's largest tobacco-growing state. Serving as an ironic counterpoint to present-day documentary material is footage from Bright Leaf (1950), a vintage Warner Brothers melodrama that is purportedly a fictional account of John Harvey McElwee's life. His great-grandson describes the film as a "cinematic heirloom, a surreal home movie enacted by Hollywood stars." Starring Gary Cooper and Patricia Neal, Bright Leaf is one of director Michael Curtiz's more obscure efforts. The overwrought tale recounts the story of a 19th century tobacco farmer who builds a cigarette empire, settles scores with a few enemies in the business—and finds true love. By cutting between the fictional film and the documentary, McElwee finds an interconnection among his own family's history, the Hollywood version and McElwee's own footage. As grainy images of his now-deceased father appear, McElwee reveals that in some ways his father has become a fictional character to him. After the rawness of his father's death has lessened, McElwee finds that his home movies "stop seeming as real as they once were; their content starts to almost take on the patina of fiction." "It's becoming harder as the years pass for me to remember specific things about my father," McElwee continues. "Slowly, inevitably, the person in the footage becomes more and more like a character cast in that scene. He's become like an actor in the scene and the scene is about the loss of my father." McElwee intends for fiction and nonfiction to reverberate as he reclaims his ancestors both for himself and his audience. A fundamental part of McElwee's aesthetic is to make himself an onscreen character. What does that mean for the filmmaker? "It can mean you're very foolish," deadpans McElwee. "Or it can serve to strengthen and make more complex the territory the film is trying to explore. I think with me it came out of a desire to forsake the tenets of cinéma vérité, which decree that as a filmmaker you always stay behind the camera and interfere as little as possible with what's going on in front of the camera—for all intents and purposes, affect invisibility." He points to Jehane Noujaim's The Control Room as a recent example of vibrant cinéma vérité and to the influential work of Frederick Wiseman and the Maysles brothers. McElwee teaches documentary production at Harvard, and he cautions his undergraduate students to not involve themselves in their own work, as it can be "tricky territory." Rather than screening his own films, his curriculum includes Wiseman's films and Ralph Arlyck's work, and he invites Cambridge neighbor Errol Morris to lecture. McElwee contends that when the filmmaker steps in front of the camera, the world of the film becomes more complete. "I want to borrow from cinéma vérité and also violate it," he explains. "I want to not just make what we normally think of as documentaries, but to create an essay form of filmmaking that allows for a filmmaker, a protagonist, to literally have a voice. For me it's also imperative that the film intersect with the real world and give way to it for great lengths of time." In Bright Leaves, real world encounters are varied: a tobacco farmer and trader on his workday rounds, a couple trying to quit smoking and McElwee's brother—a doctor—meeting with patients who discuss their smoking-related illnesses. All play a part in his exploration of his family and tobacco's intertwined history. One of his recurring editorial choices, and a remnant of his allegiance to cinéma vérité, is to keep the audio layering spare. Music cues are typically diagetic; they come out of the world of the film itself. "I like the purity of that," McElwee maintains. "In a way, I use narration as the music track." As music often sets moods and guides people emotionally through a film, McElwee uses his voiceover narration in the same way. He also forgoes onscreen titles, identifying characters and settings through voiceover instead. While he occasionally makes notes in the field during production, McElwee edits and writes his film simultaneously. Ninety per cent of the film is composed in the editing room, as McElwee goes back and forth between the text and the images. "The shaping of the film is a fairly linear experience and holds to the chronology of my experience," he says. "But [the film] really gets formed in the editing room." He often returns to his own extensive archive for material. Bright Leaves was shot on 16mm film, and McElwee used the Avid editing system clone, Media 100, during post-production. Although he acknowledges that shooting on film and the film post-production process are an increasingly archaic technology whose era has passed, after screening a 35mm print of his feature at the Seattle International Film Festival in June, he enthuses, "It was just glorious to see the images on a large screen in front of a large audience." New York's First Run Features will release Bright Leaves on August 25 at Film Forum in Manhattan, and a national rollout release will follow. Sherman's March, the full title of which was originally Sherman's March: A Meditation on the Possibility of Romantic Love in the South During an Era of Nuclear Weapons Proliferation, is now out on DVD, also through First Run Features.